As many of us know, blenders are versatile kitchen tools. Besides making smoothies or mean milkshakes, these household appliances can be used to make salsas and various sauces, condiments, pancake or waffle batter, baby food, or even homemade nut butters. That said, the blender is undeniably a device just about anyone would benefit from having. In fact, according to Statistica, the retail unit sales of blenders in 2018 was 25.5 million in the United States. In 2010, that number was only 17.9 million. Clearly, many are aware of what the average kitchen blender has to propose. However, many folks won’t just settle on any electric blender; they want something that will be functional according to their needs, will present high-quality materials that will last a long time, and won’t be priced too high for what it is worth. As you search for that perfect blender, you may notice that some of the hottest brands at your fingertips are Ninja and Nutribullet. Looking to see what both of these brands have to offer and scoping out some of their top models, you will be able to discover that new appliance you’ve been hoping for, and thus, be able to produce beverages, batters, and the like, like a pro. As apparent by the image above, Nutribullet’s appliances come in a plethora of colors, capacities, and sizes. Likewise, they also have variant motor power options. The variety at hand makes Nutribullet most applicable for those who want many options to choose from as they select the right blender for their wants and needs. According to Nutribullet, they manufacture “the world’s first nutrient extractor.” Their primary goal for their products is to ensure as much nutrients are contained after the process of blending. Yet, at the same time, many reviewers allude to the fact that they love that they don’t have to chop up fruits and veggies into tiny bits and pieces just so their Nutribullet can provide a persistent smooth texture. Nice consistency while keeping healthy nutrients contained? The best of both worlds! 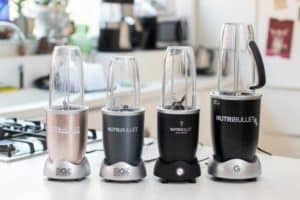 However, one issue some claim is that blenders from Nutribullet struggle with blending when it comes to making a smoothie or milkshake with heavier ingredients; the blades sometimes hesitate. Some discover that they have to pause the blending process and either shake the canister or mix up the ingredients with a spoon before re-blending. But in all honesty, isn’t this what we have to do with most blending appliances? Another thing important to bring up is that when it comes to working with ice, appliances from Nutribullet are not your most reliable bet. 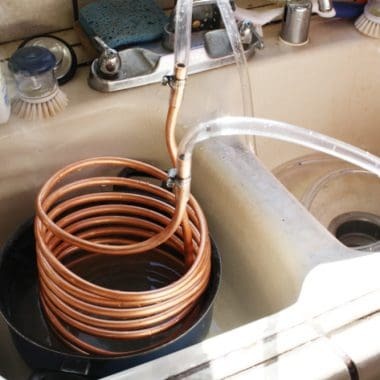 However, it’s not like most of us would not anticipate that a bullet blender to be adequate at breaking up ice anyways. But nevertheless, this might just be a dealbreaker for those who like a good, frozen smoothie on a blistering summer day. Overall, for what you pay, is the functionality of Nutribullet appliances worth it? Some say not quite while others say a confident yes. For the most part, Nutribullet devices have decent construction and durability thanks to their use of BPA-free plastic, but overall, the quality certainly doesn’t hold five stars. For instance, due to the non-microwaveable plastic parts, some might consider this company’s bullet-styled blenders to be slacking in comparison to competitor brands. Also regarding quality, there are a couple of things important to note. For one, users of Nutribullet machines find that when they are using their product for a continuous length of time, they start to smell an electric or burning tire smell. However, it is important to note that most blenders should not be in use for more than 40 seconds at a time. Unfortunately, Nutribullets lack a pulse feature that would otherwise make it easier to blend for shorter periods of time. But taking a brief break in between blending isn’t such a big deal. The second thing vital to consider is that some consumers comment that the contents inside the cup as they’re blending occasionally leak, making things more challenging to clean. However, it is critical to ensure that the lid/blade is firmly attached to the cup before placing it on the machine itself and beginning the blending session. At first, you may wish to check every so often as you blend to ensure your device isn’t leaking, so you get a better idea just how tight you need to attach the lid prior to beginning the smoothie-making session. As for the longevity, Nutribullet machines are guaranteed to last at least a year. The company recommends replacing the blades every six months. Depending on the care you provide your unit, the device itself can last anywhere from a little under a year to a whopping five years, even with daily use, according to reviewers. The costs of current models of Nutribullet, Nutribullet Pro, Nutribullet Balance, and Nutribullet RX are listed on their website at $69.99, $99.99, $149.94, and $149.99 respectively. All bullet blenders from Nutribullet have a one-year warranty that covers any defects present in workmanship or materials. There is also a 30-day money-back guarantee if buyers are not happy with their bullet. Ninja offers both full- and personal, bullet-sized blenders. While these appliances tend to have a more masculine appearance partly because of their bulkiness, these machines still feature sleek, minimalistic designs perfect for the 21st century. Thanks to the tough blades of Ninja’s appliances, it is safe to say that their blending function easily goes beyond most customers’ expectations. In fact, the consistency of Ninja full-sized and bullet models is superb. If you’ll be blending leafy greens, fibrous vegetables like celery, nuts and seeds, or seedy fruits like strawberries, you will be delighted to know that you won’t experience awkward lumps, chunks, and out-of-place bits and pieces in your smoothies and soups when you select an appliance from this company. Likewise, you can expect you Ninja appliance to be capable of dealing with ice, unlike its Nutribullet counterpart. That means you have a greater range of beverages and other recipes you can whip up at your convenience. There are many things to love about Ninja’s blenders when it comes to overall value. For one, these devices feature BPA-free parts. While usually, people prefer blender with glass pitchers as plastic tends to scratch easily and generally not last as long as glass, reviewers give kudos to Ninja for their fairly sturdy, non-glass pitchers. One issue some customers claim with Nutri Ninja machines is that the suction ring on their lid tends to have some sort of gummy residue. Although, this may be merely a minor inconvenience for most users. Secondly, some dislike that Ninja’s blenders don’t have a chute to allow them to add ingredients as they blend, which some recipes call for. Having to stop to add ingredients may not, however, be much of a dealbreaker for some consumers. In Ninja’s defense, their models are pretty high-powered machines. Thus, perhaps adding ingredients mid-blend wouldn’t be such a good (or safe) idea anyway. Another quality complaint with Ninja machines, although minor, is that the rubber bottom on some of their appliances that keep them stable in place have a tendancy to wear away pretty fast. But the good news is, Ninja is known to quickly replace parts like this, that is, if you have your receipt, and your warranty is not yet void. At a minimum, blenders by Ninja are designed to last a year. According to reviewers, the average lifespan of these appliances is few years, which for the price, is decent. However, there are a few reports of some customers’ machines giving out after a few months. Fortunately, the warranty would certainly cover any defects or poor workmanship present. The newest arrivals offered by Nutri Ninja include Ninja Ultra Prep, Nutri Ninja with FreshVac, Ninja Smart Screen, and Ninja Smart Screen with FreshVac. Costs are currently listed as $79.99, $99.99, $169.99, and $229.99 on their website respectively. Each of Ninja’s newer models automatically come with a limited one-year warranty that covers defects in workmanship or materials. Additionally, they offer a 60-day money-back guarantee. For having plastic pitchers, the quality is surprisingly good. Most models feature a powerful motor with 1,000 watts. Rubber base wears off too soon. Tend to be more costly; short warranty doesn’t make up for it. Sharp blades are difficult to clean by hand. Even the Ninja bullets, which are designed to be more compact, are difficult to store at times with their semi large power bases. Based on the latter facts, Ninja wins our hearts by a narrow victory, only because we can still see that Nutribullet appliances have their perks that make them unique and useful. In fact, for some, a blender from Ninja might be a better choice. However, for another they might prefer its competitor. It is critical to weigh the main differences and manufacturer exclusives to decide who has the best blender most suitable for your demands. To help with your personal choice, we’ll list three top models from each of the two competitors and compare the top-rated one from each. It is clear that Ninja and its competitor, Nutribullet, have their fair share of variances. If you’re looking for a full-size blender, you won’t get it from Nutribullet. 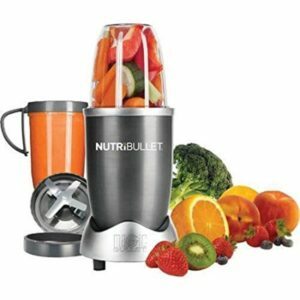 As for those who are looking to invest in a bullet blender, going with Nutribullet might be your best pick considering this type of blender is the brand’s specialty. To top it off, Nutribullet also has a Bluetooth-enabled blender series, proving themselves to be quite an innovative company. For those who want a smoother consistency, going with Ninja might be your best bet. However, Nutribullet still delivers texture that is pleasant enough, and not to mention, Nutribullet claims that their extractor technology ensures as little vitamins and nutrients from fruits and vegetables are diminished as possible. 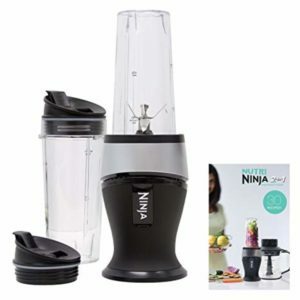 Similarly, Ninja also often has the best blender when it comes to blending ice and frozen or thicker ingredients. Its competitor, however, is quite the opposite. Price-wise, many Nutri Ninja are harder on the pocket when compared to the costs of its competitor’s products, but warranties are comparable. If quality and length of life are the most important to you in a blender, especially if you plan on making a smoothie once or multiple times a day, Nutribullet machines might not be your best choice. But if you’re hoping for a blender that is easier to store and travel with, this company’s products are certainly great to consider. 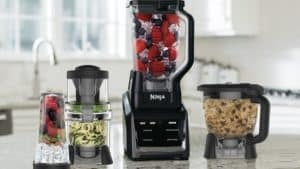 Nutri Ninja manufactures a wide range of kitchen appliances: coffee makers, cookers, normal-sized blenders, bullet blenders, and food processors. On the other hand, Nutribullet specializes in merely bullets. Additionally, some Ninja products feature FreshVac, which is a one-touch pump that removes oxygen before you blend to ensure flavors, vitamins and nutrients, and colors are preserved. Considering FreshVac is exclusive to Ninja, you won’t find FreshVac in any other blender. 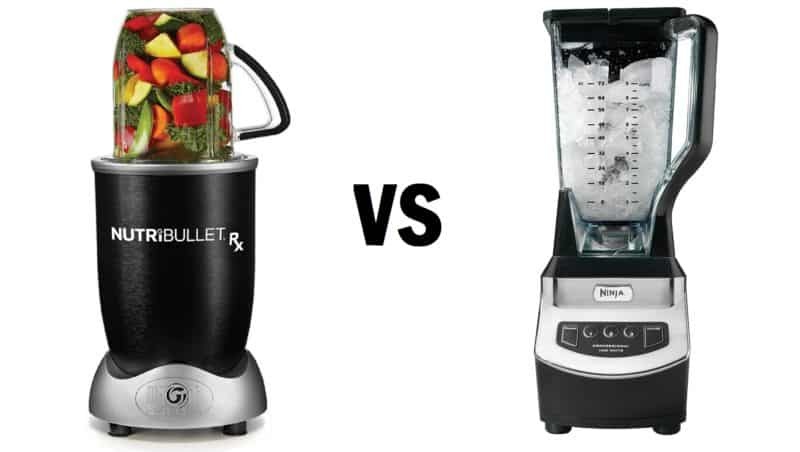 Comparing a top-rated model from both Nutribullet and Ninja, the NBR-0801 and the QB3001SS respectively, we can better understand who may be the so-called “better” competitor on the market. Let’s engage in a mini review of the two to see what we can dig up. Customers report that the appliance leaks. Its seal lids stay sealed and are easy to drink from. The Ninja QB3001SS is deemed the winner in this case. Why? Well, for one, its capability to blend is greater. It can tear through ice cubes, frozen ingredients, and even meat, all while still ensuring you aren’t left with a chunky, gritty texture. Additionally, many love that the QB3001SS comes with two convenient lids for enjoying your smoothie, protein shake, or milkshake on-the-go. While the QB3001SS is more basic in appearance than its Nutribullet NBR-0801 counterpart and only offers one canister size (16 ounces), it’s the function and grade that allow it to be considered the more reliable selection. Even its pitfalls, from its bulkier construction to the fact that it’s a little louder and only offers one cup size, can be overlooked due to the various benefits of this model. This is especially true since both machines are priced the same. However, this varies depending on where you buy your blender. All in all, the NBR-0801 model can be considered the more attractive, easier-to-store option and is more convenient in terms of not making a ton of noise. To top it off, this Ninja blender comes with cups of two different sizes. However, if you’re more concerned with a device that has a durable blade design that can tear through tough ingredients, the ability to crush through ice in a matter of seconds, and includes travel-friendly lids, the QB3001SS might be better overall for you. But nevertheless, one thing is for sure: both Nutribullet and its rival make making smoothies and other recipes very simple, and if anything, quite effortless that just about anyone could do it with their machines. Likewise, both offer great models that won’t break the bank. There are plenty of considerations to think about before buying a blender. Some may argue that Nutri Ninja is the better brand as it is essentially the Louis Vuitton of small kitchen appliances with its performance and features, at least in comparison to the more casual, more affordable Nutribullet. Additionally, Ninja has exclusives that set it apart from its competitor. However, others are content with a slightly less-advanced bullet blender from Nutribullet if it means they can save money while still getting favorable function and standard along with an attractive and easy-to-store machine. Many also trust Nutribullet machines to be excellent when it comes to properly extracting healthy ingredients in their richest and most nutritious form. Including some or all of the above factors as you select the best blender for your needs, you should be able to spot a model that is applicable to what you plan to use it for, works just as you anticipate, and looks stunning on your kitchen countertop. Whether you opt for a new or older model on the market, there’s certainly the right blender out there for you that you will be more than content with.